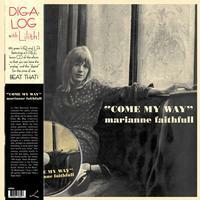 In 1965 Marianne Faithful released two debut albums simultaneously, a self-titled pop album and an album called Come My Way comprised somewhat unexpectedly of folk tunes. While the first album generally reaffirmed her persona as she-devil and soulless poster child of that hedonistic generation, the latter gave listeners a fleeting glimpse of a hidden darker side, perhaps an unintentional fortelling of those black days that wøuld soon follow. This reissue features four bonus tracks: Her classic 1969 single "Sister Morphine," released before the Rolling Stones' version, the 1964 B-side "Blowin' in the Wind," "Et Maintenant," from a 1965 EP and the 1966 B-side "That's Right Baby."